Witness a remarkable iridescent product of nature as it emerges from the indigenous Washboard mussel. Tennessee’s Official State Gem – the freshwater pearl - is rarely found naturally from these living animals, but grown at the only freshwater pearl-culturing farm operation in the North American continent. The organic gem stone-culturing operation is nestled in the pristine embayment of Birdsong Creek – just off the scenic Tennessee River’s beautiful Kentucky Lake – in Camden, West Tennessee, 9 miles north of Interstate 40 at Exit 133/Birdsong Exit. 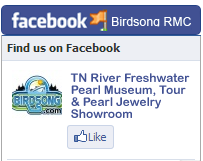 The Tennessee River Freshwater Pearl Museum, Farm, Tour and Jewelry Showroom is located at Birdsong Resort and Marina in the NEW Pearl Museum/Community Center. Call (731)584-7880 to make appointment to visit our Pearl Museum or Click here to learn about our available Tour Packages. Birdsong Resort is the home of The Tennessee River Freshwater Pearl Farm - the only freshwater pearl culturing farm in America. Originally founded by John R. Latendresse (1925-2000) as one of eight pilot farm locations in 1979, all productivity measures eventually narrowed to the one location in Birdsong Creek. John and his wife Chessie, had attempted for many years to adapt the Japanese technique to our native waters, and species of mussels. 1984 was the first year a productive harvest was turned. The farm is now in the possession of Robert G. Keast, owner of Birdsong Resort, Marina and Campground in Camden, TN. The farm still is working, growing and producing the pearls Latendresse founded in North America. The pearl farm is unique and a popular stop along the Tennessee River halfway between Pickwick and Kentucky Dams and halfway between Memphis and Nashville on I-40. There are many reasons to visit the farm and museum, besides the fact that it is one of a kind. It has many other facets than a pearl farm and museum. 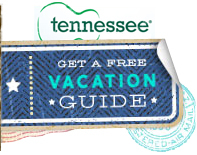 A boater can dock at the marina, stay in one of the cabins overnight, visit the museum and take the farm tour, then he can use the courtesy car, and visit one of the eleven restaurants in small west Tennessee town of Camden within nine miles of marina. A true southern hospitality destination operated in the same family tradition since 1961 where their business is your pleasure. America's Heartland reports on Fresh Water Pearl Farming at Birdsong. CLICK HERE to see their report. In our NEW Pearl Museum/Community Center you will see items on display depicting the freshwater pearls and musseling industry in general educational/ informational terms, follow the story board on techniques of pearl culturing, exhibits from local contribution, and other items of interest related to our Tennessee heritage. Brief video presentation. Call (731)584-7880 to make an appointment to visit our Pearl Museum.